Looking for something special to give to your Mum for Mother's Day? This beautiful DIY Mother's Day Gift Altered Canvas is the perfect gift and something she will cherish forever. I really had so much fun making this canvas gift for Mother's Day. I thought the photos we took in Kauai of me, my mum, and daughter went perfect with the Jenni Bowlin Tangerine mini papers! I just love the way it turned out! So I thought I would write up and share the step-by-step tutorial with you! 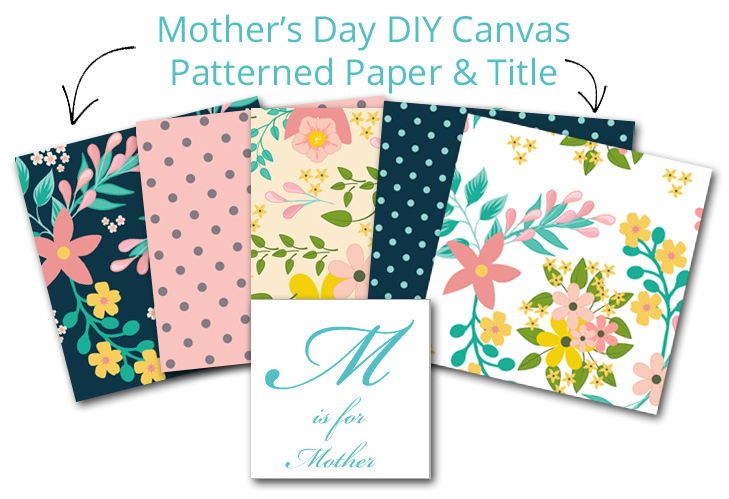 DOWNLOAD PATTERNED PAPER PACK & TITLE HERE! 1. Place wax paper on work surface and paint 12”x12” canvas using a sponge brush. Let dry. 2. Cut eight 3.75” squares from blue cardstock and sand edges. Adhere to canvas, as in sample picture. 3. Print patterned paper or cut eight pieces of your own patterned paper to 3.5” square and ink edges. 4. Add rub-ons to top right and bottom left corners on two of the square pieces of patterned papers. 5. Adhere all of the squares over top of the blue cardstock squares. 6. Cut small journalling strips from the blue cardstock & using a white pen, attach the strips to the middle left square. Adhere felt hearts to the same square using double sided tape, as in example. 8. Print title “M is for Mother” on white cardstock and ink with brown ink. Mat with blue cardstock leaving approx ⅛” border. Sand edges and adhere title on top. Add bling if desired to M, as in sample. Adhere title block to bottom middle square using thin foam pop-dots. 9. Using a matching journalling card, measuring approx 2.5” x 4”, write your journalling on the inside and fold in half. Optional: Adhere one side of a magnet on the inside of the journalling card at the top and the other half on the back at the bottom. 10. Fold a small piece of ribbon in half and adhere together. This creates a “handle” to open the journalling card. Attach to the inside top of the journalling card (over top of the magnet, if using). I found double sided tape to work the best for this. Adhere the journalling card to the canvas. Have fun with this and make if your own! 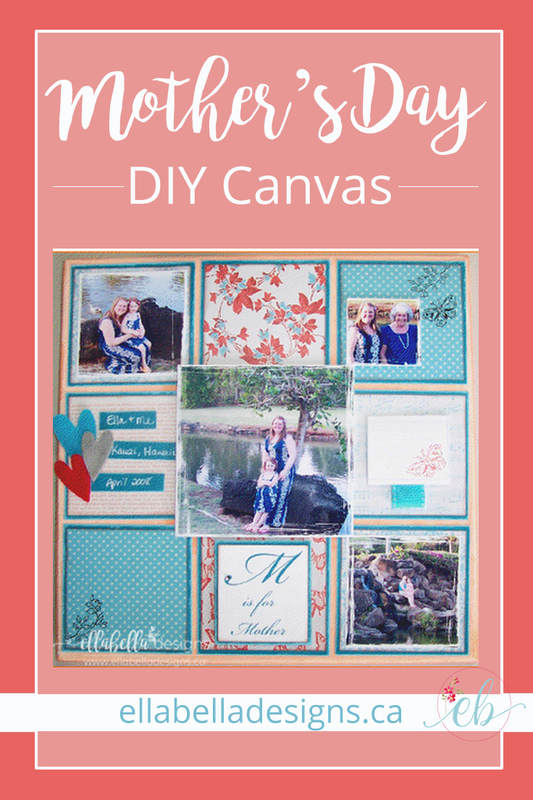 Feel free to add photos to the canvas if desired or use different embellishments, etc. I would love it if you shared! Pin this post! Do you have any plans for Mother's Day? Will you be handcrafting a gift this year?